A morning not too different than any other morning. Breakfast with Jo Ann reading the NY Times. Feeling pretty chilled. Happy and grateful for my life. Then time to get down to the serious preparation for a big competition. Results for the day were just like the story I had written before the tournament (it wasn’t in a blog, just in my mind). I am a focused competitor who competes for each and every point. Each point has meaning for me. I give my full effort to winning each point. I accept when I miss and move on quickly. I believe in myself and know that if I am my true self on the court I will have a chance to win a lot of points. I may win the match. I always win the experience. I play with dignity and class, even if things are going badly. I will just fight my way back and be a proud warrior. I am eager to face the beasts of the game of tennis as they are mostly created by my mind and I love to battle that part of myself. I love when it is hard. I appreciate that I can play this great game. And so it played out. I was, for the most part the person/player that I wanted to be. I thought about it before playing and while playing. I kept holding myself accountable to my story. It took effort. It was worth it. I did the internal work and the external took care of itself. 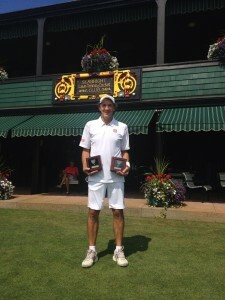 I won the National Singles final today 6-4, 6-2. It has been a hard week of a lot of tennis. I have played for 12 out of the last 14 days. My body is tired and sore. My spirit is content. My mind has great clarity on the matches, especially this final one. I didn’t play as clean a match as I had played in the semis. I had to face adversity as one of the beasts of the game surfaced. I have played and competed and worked on my mental game for years, stressing myself by fighting against the unavoidable moments of tightening up. A time when doubt or fear or worry sneak in to what, until that moment, had been a mind that was like a locked box. No leakage. Nothing sneaking in. I had learned to deal with them effectively. They lost their power. I guess, though, they are a little like roots in the mind and they can resurface. And they have to be dealt with again. In my match I had taken good control in the first set, going up 5-2 against Mike Dahm. He had been ranked in the top 2 in the USA this year for a couple of months and he is a 6’3″ seriously good serve and volleyer. I was serving into the Sun, the side that I had been struggling with for much of the tournament. The thought about serving out the first set came on the court with me after we changed sides. The dreaded FUTURE TRIP. Thinking about results. Mike hit a couple of good returns after I missed first serves. I was down 0-30. More thinking about needing to win this game. Worry. I won a point barely after missing another first serve. Missed another first serve and double faulted. Got back to deuce and double faulted. Oh boy, this is getting hard. Couldn’t buy a first serve but got back to deuce and double faulted again. Getting tighter I missed a forehand that was not all that tough. Shoot I hadn’t lost my serve all week. Ok. No big deal. Still up 5-3. I will win it now. Another counterproductive future trip thought. Mike raised his game, made good serves and I didn’t put a return in the court, two in the net and two out. Ok, well I am serving at 5-4 up a break. I am a lefty with a good serve, not serving into the Sun. I will be fine. But I had lost some of my confidence. Missing first serves and struggling. Down love 30. Down 15-40. Rushing. Pulling down on my serve. Missed another first serve and then slowed everything down. I knew what was going on. I had been here before and I had both failed and succeeded before. I had improved my mental game to deal with this. It is what I love about this game. That I have to to something or will have failed myself. I might not win but I will not fail. I will find a solution. I knew I needed to drag myself back to my story. To be focused. I will win the experience. I will be a proud warrior. I will not be defeated by my mind created stories that don’t work for me. So I stopped. I shoulder shrugged the tension out of my neck, shoulders and back. I flexed my knees to relax my legs. I took deep breaths. I focused on my breath and it dragged me out of the future back into the present. It took three break points against me but I kept working my mind back to the right place and I won the game and the first set. It was a relief. The second set, I again went up 5-2 but this time, thanks to the practice in the first set, there was no future. Just one point. One point. One point. And I played each point with purpose. I closed it out 6-2. 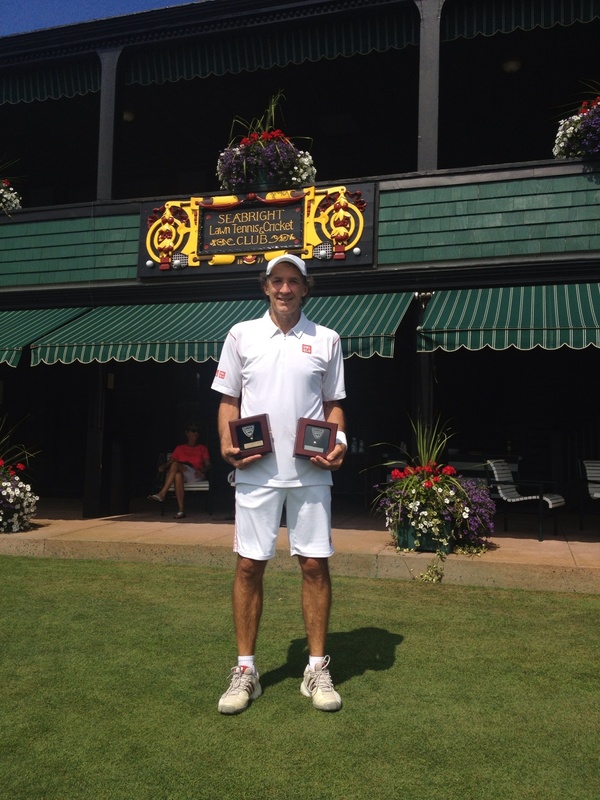 I am thrilled with the results of winning two National Championships at one tournament. It is an accomplishment. I am even more excited about how I competed and how I took a story that was fiction when I wrote it, moved into it and made it non fiction. I wrote and then lived it. It was a guide for me. I am also glad that I choked in this match. In every match there is winning and losing. In every match there are lessons and parts to be worked on. I got to work on dealing with an old beast that comes with the game. Thinking about results before they arrive. Seeing how it affects the way I operate is a gift that helps me stay determined to be diligent mentally. I am glad that I got more practice at it because somewhere in the future it may pop up again. And I will have improved at how I deal with it because of this match. Thanks to all for following along and for your supportive comments. Your advice and support help me along the way. Please, if you like my blog, forward it to others who you think might like to read it. Now I will get some rest. So honest bobby, congrats once again! congrats Bob – shared your story each day while in Taiwan with people who were not tennis players to show them what was possible. Again, your lessons in tennis have a greater application to all aspects of life. Your words clarify what we all have to work on. Congratulations on another victory! It’s always enjoyable sharing your tennis journey. Now it’s time to treat yourself to a good massage and some time in the hot tub! well done…now sit back and relax…thanks for the great words…. Bob, You are amazing. You may not remember me, I’m Steve Deppe’s sister. Cam’s Aunt. Steve sent the opportunity to receive your Blog and I’m so glad he did. Congratulations on your wins this week. Wish we could have been there to see you play. And, liked hearing how you got yourself back mentally. You are a true champion. Let’s see how Djokovic and Nadal do today. Great match yesterday with Serena winning. Congratulations Bob on another terrific win! I am glad you were a successful warrior and battled those “beasts” within you towards a victory! All my best to you and Joann! What a great week winning 2 National Championships. So interesting to read about your journey both mental and physical. Congratulations Bob. From us, the Maccabiah “Band of Brothers” who are so proud of you for your double national victory, and the ways you have shown us. You are truly a living example of positive thinking and excellent doings. All the best. Sam Sporn et al. i met bob in 1975 at a tournament at Curtain Bluff,Antigua,W I.i’ll make a long story short. 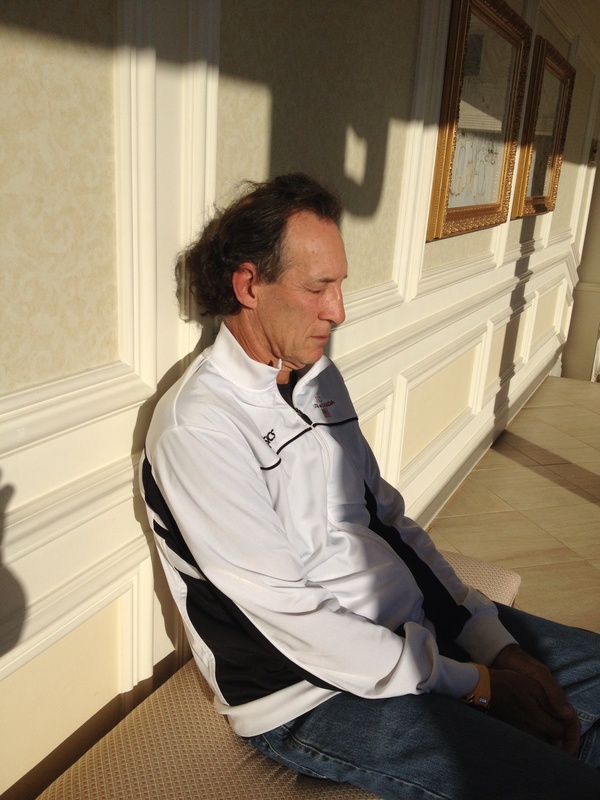 i taught bob all i know about tennis over many pina coladas.bob has carried my insights to this day. p s,never let the truth interfere with a good story . Great wins, Bob. Ronnie & McKenna commented that you played great…….Charlie was equally tough and they knew you’d win the singles. Well done and well deserved. Always impressed with how you reflect, and think your way into a positive place. Have found it very helpful in my golf competition, and also tennis. Thanks for all your thoughts. Anne B. Happy for you. I have learned to have visualize losing in tennis as a goal so I am never disappointed. It saves me the problem of getting too introspective and remaining the shallow person I am. Won’t there be suspicions that a Jew winning 2 national championships must be on drugs? Great accomplishment..